In a double boiler, melt the chocolate over simmering water. Remove from heat, mix in the butter until smooth, then whisk in the cream, the vanilla, and the wine. Cover and chill until it firms up. 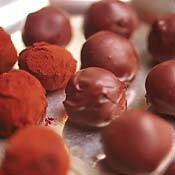 Then form round balls (1 to 1 1/2 inches) of the chocolate mixture and roll them in the cocoa to coat. Store, covered in the refrigerator until just before serving.